I just read about five habits that matter more than recycling which explains that some habits make an even bigger reduction in your carbon footprint than normal recycling. 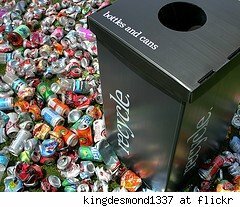 I’m all for that but instead of stating they matter more, lets make sure and combine them with recycling. Avoid bottled water at all costs. Even one bottle per month will add up to 2.6 tons of CO2 in a year. If you’ve forgotten your water bottle, trying going without instead of buying a bottle. Reduce your air time. Flying is a huge CO2 waste so try and combine trips or travel a little less if you can manage it. Go veg. Being vegetarian or vegan can reduce 1 to 2 tons of CO2 in a year. Can’t go all the way? Start small like being vegetarian one day per week, or going for vegetarian breakfast or lunch. It will still lessen your impact on the environment. Wash your clothes in cold water and air dry them. This can save as much CO2 as all the recycling you do in one year potentially. I’ve been doing this for almost a year and washing in cold water has not been a problem at all. You can air dry clothes on hangers in the shower or on drying racks indoors in the winter months. Check your utility company for green power options. Some companies will allow you to sign up for special green power programs and the CO2 savings can be huge. Plus, the more people that sign up for this option, the faster the utility companies will get the ideas that we want sustainable, responsible power options.